When Pope John Paul II died, Suzanne Strempek Shea, who had not been an active member of a church community for some years, recognized in his mourners a faith-filled passion that she longed to recapture in her own life. Shea, never one to do things in a conventional manner or by halves, set out on a pilgrimage to visit a different church every Sunday for a year-a journey that would take her through the broad spectrum of contemporary protestant Christianity practiced in this country. She began with a rousing Baptist Easter service in Harlem, traveled to Colorado’s Pro Rodeo Hall of Fame for a sing-along service at the Cowboy Church, and flew to Houston for a multimedia experience at Joel Osteen’s Lakewood Church, the largest church in the country. She sat with the Shakers, and-in silence-with the Quakers; she sang often, danced, and even drew on one memorable occasion. Shea approached each congregation with the curiosity of a newcomer and with respect for each unique expression of faith, whether the sanctuary was a multimillion-dollar extravaganza, a centuries-old edifice, an abandoned building, or even an airport chapel. In her tour of more than thirty states, including Hawaii, Shea: * Knocked knees with President Jimmy Carter at his Plains, Georgia, Baptist church on Independence Day. * Joined the band at a San Francisco African Orthodox church that considers jazz legend John Coltrane a bona fide saint. * Got a wake-up call from Anne Graham Lotz, Billy Graham’s preacher daughter, at a sprawling conservative church in South Carolina. * Followed the signs for a hot tub dealership that, in the wake of Hurricane Katrina, has become a new Presbyterian church in Mississippi. * Collected tips on The Purpose Driven Life from Rick Warren at his famed Saddleback Church complex. * Knocked on the door of the Jehovah’s Witnesses in Portland, Oregon. * Shared a pew with Milwaukee Bucks star Michael Redd at the Columbus, Ohio, church he purchased for his dad. * Had her feet washed by a Seventh-Day Adventist at a church in Connecticut. * Attended a three-hour service featuring speaking in tongues, faith healing, and dancing in the aisle at a Foursquare Gospel church. * Toured Joseph Smith’s birthplace in Vermont and worshipped with his Mormon followers. Sundays in America is an essential guide for those seeking a new house for their worship as well as a colorful road trip for the armchair explorer, providing a vivid perspective on the practice and meaning of Christian faith as it is practiced throughout our land. 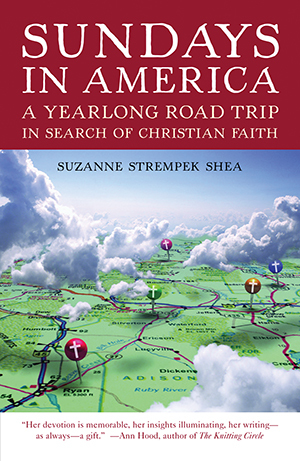 "For a year, Suzanne Strempek Shea traveled the country visiting the Protestant churches that had been verboten during her Catholic youth. Her journey took her to well-known congregations including Rick Warren's Saddleback Church in Lake Forest, Calif., and Trinity United Church of Christ in Chicago. Finally, in an interfaith chapel in the Denver International Airport, Shea recognizes 'that we are always in God's house, wherever we find ourselves.'" "A former journalist, Shea luxuriates in visual descriptions of each stop on her itinerary. She's a catchy writer . . . and her factoids can be as interesting as her word choices." "We are there, joining Shea in every church-induced behavior from fright and fidgeting to unscripted hallelujahs. And we like her company, this softly spoken woman graced with wit and quiet charm. She's warm and generous, sharing her family and her life as freely as she shares the pew . . . it has much to teach anyone who warms a pew with any regularity . . . Shea is an able prophet decrying the consumer in the church marketplace, where it is common practice to test-fly churches." "Shea found a passionate faith-particularly in evangelical churches-that she hadn't found in her own Catholic Church." "Her pilgrimage included Jimmy Carter's church in Plains, Barack Obama's church in Chicago (Rev. Wright wasn't there, nor was Obama) and others-exotic and not-from the Hopi Nation to Appalachia, from Maui to the West Point Academy. It's an illuminating read, well worth your time." "It was for her and is for readers a captivating trip into the heart of non-Catholic Christian America that reveals the amazing diversity of one complex faith."